What is Mucous-Clear Phlegm Away? How has Mucous-Clear Phlegm Away helped others? How do I use Mucous-Clear Phlegm Away? Having excessive phlegm can be a very bothersome problem and may lead to hours of unrelenting throat clearing and coughing. For some people, this is a temporary problem that lasts as long as the infection that causes it. For others however, excessive phlegm becomes an ongoing problem for which there is often little relief. Excessive phlegm (or chest mucous) is often caused by viral or bacterial infections such as influenza, post nasal drip, bronchitis, pneumonia as well as irritants such as those inhaled during smoking. Other possible causes also include allergies, Candida infection and COPD or chronic obstructive pulmonary disease. The colour, consistency and amount of phlegm produced can be a useful diagnostic tool to help your physician determine the cause. There are many ways in which you can try to soothe your throat and remove small amounts of mucous naturally. Drinking 8 glasses of water will help the mucous ‘loosen’ and discourage it from becoming thick. It is important to relax the throat – try relaxing the muscles in the neck, jaw and shoulders to find relief. A strong swallow (with your chin tucked down) or gentle humming is also a way of clearing the throat without the harsh need to cough. Natural remedies can also help to support healthy open airways and un-clogged throats. In fact, natural remedies have been used in traditional medicine for thousands of years to support the health of the entire respiratory system. Mucous-Clear Phlegm Away is a 100% natural homeopathic remedy formulated for the relief of phlegm and throat congestion. Mucous-Clear Phlegm Away can be used to safely support the delicate structures in the throat, without harmful side effects. This remedy contains a selection of homeopathic remedies known for their ability to address common discomfort caused by mucous in the throat passageway. Due to the concentrated tincture formula, Mucous-Clear Phlegm Away Drops are absorbed into the system with ease – exactly when you need it! Kali mur D6 - this effective remedy and biochemic tissue salt is best suited for coughing that is acute, spasmodic and harsh. It is also used to address thick, tenacious mucus. Kali sulph D6 is a biochemic tissue salt that is very useful in helping to clear congestion in the throat. It is also well known for its cleansing properties. Kali bich 6C is usually given homeopathically for complaints affecting the mucous membranes, especially in the nose and throat. Mucous-Clear Phlegm Away contains no gluten, artificial flavours, colours or preservatives. It is suitable for vegetarians and safe for all ages. 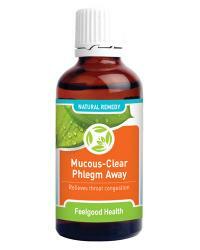 Mucous-Clear Phlegm Away is presented in a concentrated 50ml tincture formula, making it easy to take. Hold bottle upside down and administer 10 drops directly into the mouth. Alternatively dilute 10 drops in quarter cup water and sip slowly. Children under 12 use 5 drops. Dosage may be repeated 3 - 5 times daily if needed until symptoms subside. May be used with Immunity Plus for ongoing immune support and ComfiCoff syrup if needed. Mucous-Clear Phlegm Away supports the body on a cellular level – helping to support soothed, open, clear throats - from the first dose. Mucous-Clear Phlegm Away contains homeopathic ingredients in a tincture formula that facilitates rapid absorption into the system – just when you need it! One bottle of Mucous-Clear Phlegm Away will last approximately 30 days (depending on frequency of use).